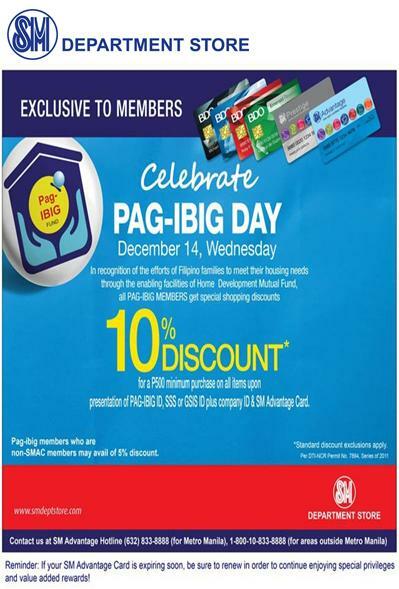 > SM Department Store PAG-IBIG Day SALE, December 14, 2011 mall hours is extended up to 10:00 p.m.
SM Department Store PAG-IBIG Day SALE, December 14, 2011 mall hours is extended up to 10:00 p.m.
SM Department Store PAG-IBIG Day today only, December 14, 2011. Get 10% OFF on All Items for a minimum P500 purchase. Simply present your PAG-IBIG, SSS, or GSIS ID together with your company ID and SM Advantage, SM Prestige or BDO Rewards Card. Non SMAC members may avail of 5% discount today. Happening at all SM Department Store branches nationwide.